Traditional art group Janchimadang in Incheon invistes 4 performers including 'intangible cultural assets' for the concert '신명가득' for 4 days, starting tomorrow. Janchimadang holds relaying concerts, inviting Gugak masters at Janchimadang gugak theater on the 26-29th. This concert will start with 'Incheon Hyangje Julpungryu' by Eung-hak Kim, the representative of Incheon Hyangje Julpungryu Preservation Society. 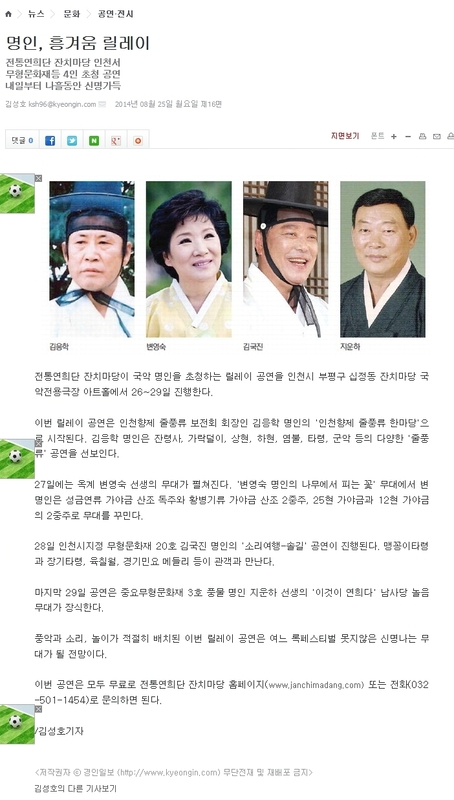 Eung-hak Kim will perform various 'Julpungryu'; Janryeongsa, Garakdeoli, Sanghyeon, Hahyeong, Yeombul, Taryeong, Gunak, etc. On the 27th will hold 'Okgye' Byeon, Yeong-suk's concert ''Flowers that blossoms on a tree' by Yeong-suk Byeon'. Byeon will fill the stage with Seong-geum-yeon-ryu Gayageum Sanjo solo, Hwang-byeong-gi-ryu Gayageum Sanjo duet and duet of 25 stringed Gayageum and 12 stringed Gayageum. On 28th, the concert 'Journey to Sori music-Solgil (소리여행-솔길)' will take place by Gukjin Kim, the intangible cultural asset (no.20). Maeng-ggoing-i taryeong, Janggi taryeong, Yukchilwol and Gyeonggi minyo(folklore songs) medley will meet the audience. The final concert on the 29th will be Namsadang Noreum 'This is Yeonhui' by pungmul master Wunha Ji, an important intangible cultural asset (no.3). This relay concert, with music by instruments, singing and entertainment well balanced, is expected to be as fun as any rock festival. All the concert is for free; Contact Janchimadang's website (www.janchimadang.com) or call 032-501-1454.